The Indian Express first reported on Michel’s India links. 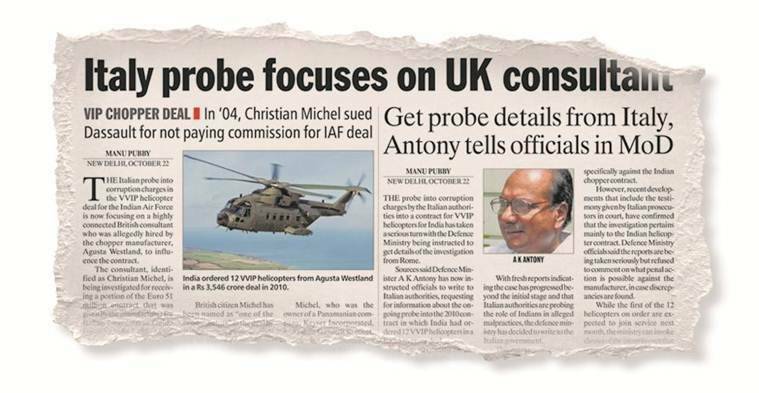 The revelations in the fourth supplementary chargesheet of the Enforcement Directorate in the AgustaWestland deal case were first reported by Manu Pubby in a series of reports in The Indian Express. From the first raids at middlemen Guido Haschke’s offices to his connections in India and from Christian Michel’s role to taped conversations that named ‘AP’ and ‘FAM’, these are among the key reports that prompted a probe that led to the cancellation of the deal in 2014. Based on the testimony of Lorenzo Borgogni, the former head of external relations of Finmeccanica, Agusta Westland’s parent company, Italian investigators raided the offices of consultant Guido Ralph Haschke. Borgogni alleged that Haschke was initially hired as an “intermediary” for a sum of 41 million euros, and that his “compensation” was raised at the last minute by 10 million euros. The Italy probe focused on this escalation of 10 million euros, which were allegedly used to bribe Italian political parties. Following the report by The Indian Express, then Defence Minister A K Anthony sought a fresh report on the procurement of the 12 helicopters sold to India. He said any wrongdoing would attract the strict integrity clause and directed his ministry to obtain a report from Indian officials in Rome into the role of Haschke in the chopper deal. Haschke, who claimed to provide ‘Project Advisory Services’, worked with several Indian companies and individuals either interested in investing in Italian entities or hoping to forge offset partnerships with foreign firms that have won Indian defence contracts. Haschke was active since the chopper deal was inked in February 2010 and had met Indian companies and investors. Haschke was involved in more than seven consultancy companies based in Europe and held dual citizenship of Switzerland and the US. 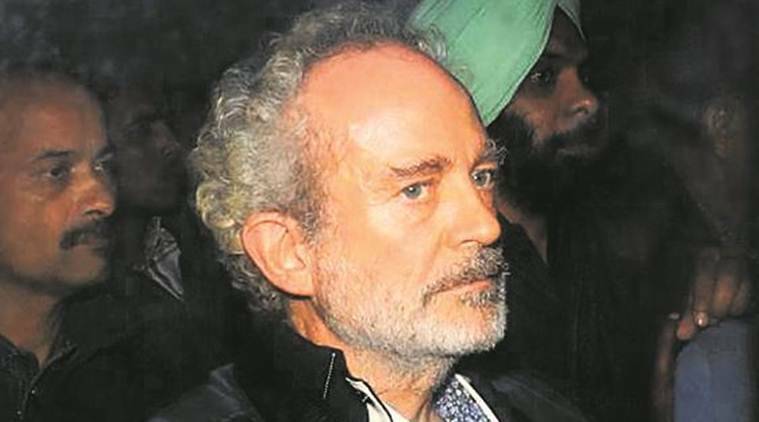 The Italian probe into the VVIP chopper deal shifted focus to Christian Michel. He was already active in India’s defence sector. Also, the Ministry of Defence asks Italian authorities for information on their investigations into the VVIP chopper deal. According to court documents of the Italian probe into the deal contained in a 100-page court order by the Tribunal of Naples, Italy prosecutors tapped phone conversations of Haschke with the India head of the Finmeccanica, Girasole Paolo, as well as some unnamed ‘Indian individuals’. Phone conversations between Haschke, Paolo and unnamed Indians suggest that commission money was routed through Mauritius and Tunisia. Italian investigators allege that Finmeccanica bribed S P Tyagi when he was Air Force chief to swing the VVIP chopper deal in Agusta Westland’s favour. Italian court documents show Tyagi was paid “certain amount of money, not yet quantified” through intermediaries. 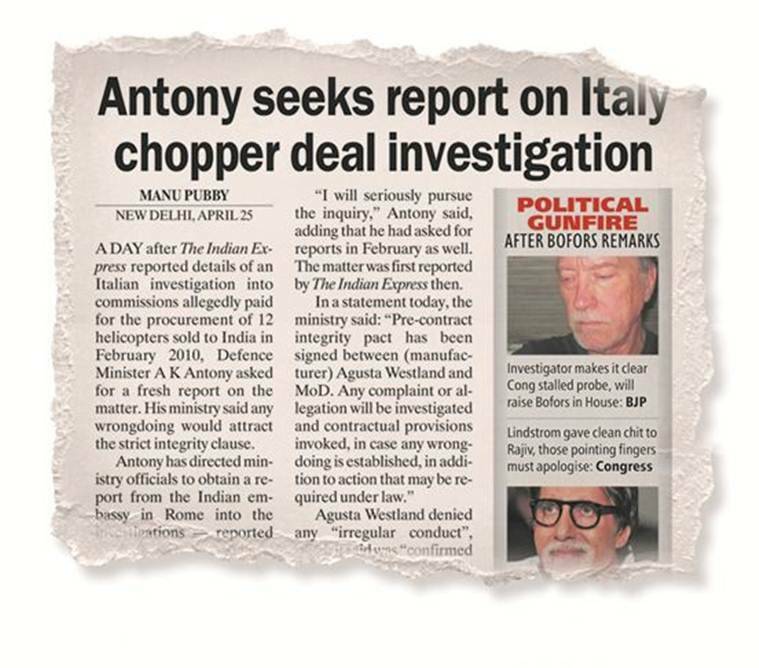 Italian court documents show Haschke and Michel drew up a “budget”, which allegedly lists Indian politicians and designations of bureaucrats and IAF officers who need to be “handled” to swing the chopper deal. Under the heading “POL”, there were two references — to “AP” and “FAM”. And under the heading “BUR”, the document listed “DS”, “JS AIR”, “AFA”, “DG Acquisition” and “another Gen”.